When I got up this Sunday morning I was so happy to be greeted by sunshine instead of the forecast possible snow because today we were going to have our 1st Annual Mile High Knitting Guild Xmas potluck at one of our member’s home. And not only that but it was also the first time that the morning and evening members of the guild would mix and mingle! People in the neighborhood must have been thinking, what the heck was suddenly happening, with cars arriving from all directions at the same time, parking, carrying bulging bags, pots and spinning wheels into that one corner house, haha! Andrea’s house smelled of Christmas goodies and was all decorated in Holiday colors. What a wonderful welcome! Thank you Andrea for opening your doors to us! 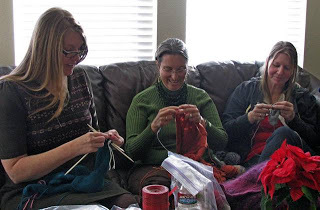 After a plentiful and tasty potluck lunch (note to self: gotta get some of the recipes) with lots of chit chat and getting to know each other we couldn’t hold back any longer and were ready to settle in with our knitting, crocheting and spinning. The sofa in the living room was the perfect sitting area with the light coming from behind over our shoulders to shine right onto our stitches. 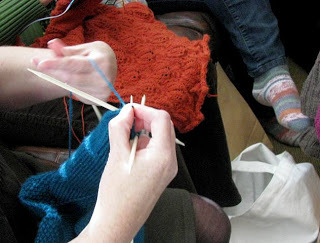 It was a lot of fun to see all the different kinds of projects on everyone’s needles from baby clothes to shawls and socks. Hm, looking at the types of projects everyone was busy with, can you tell that our Christmas knitting was in full swing? The other thing I really enjoyed seeing was the variety of techniques used, from knitting on double-pointed needles, on circulars and the magic loop. 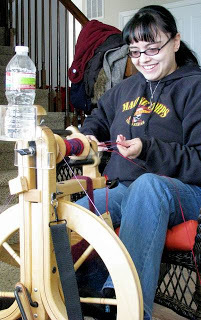 But then, the highlight of our get-together must have been the hands-on session for Navajo Plying by Chrystal. Thank you Chrystal, you did a wonderful job! It’s one thing to watch YouTube videos to learn a technique but quite something else to have a live person right next to you to show and correct you as you have a go at it. 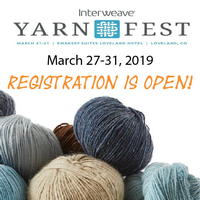 Thank you all for a wonderful first year of the Mile High Knitting Guild and I am looking forward to another year of expanding our knitting horizons and new friendships.